Robert Worby with recordings from the 2017 Cut and Splice festival. Including works by Murat Colak, Lee Fraser, Sam Salem, Katherine Young, Ana Dall'Ara Majek and Sabrina Schroeder. Robert Worby presents the second instalment of recordings from last month's Cut & Splice, the two-day festival of experimental music and sound art, curated and performed this year by the new music ensemble Distractfold. The event took place at Hallé St Peter's and Hallé at St Michael's in Ancoats, Manchester. 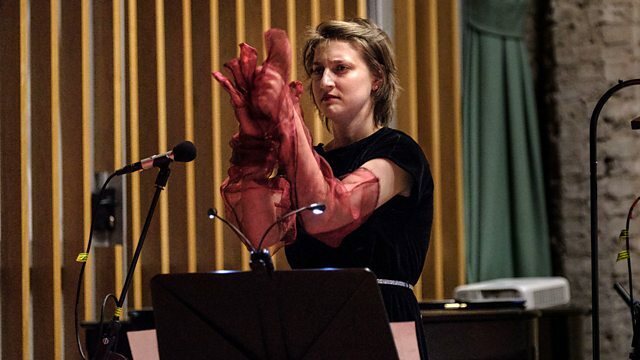 Tonight we hear acoustic, mixed media and spatially diffused electroacoustic works by Murat Çolak, Lee Fraser, Sam Salem, Katherine Young, Ana Dall'ara Majek, Sabrina Schroeder, Elsa Justel, and a specially commissioned work from Hanna Hartman. Plus we catch up with the sound art programme that was running throughout the weekend at St Michael's, including Lee Patterson's The table upended, its contents strewn across the floor. Cut and Splice is a partnership between BBC Radio 3 and Sound and Music, the national charity for new music. Performer: Alice Purton. Performer: Kathryn Williams. Performer: Emma Lloyd. Performer: Alice Purton. Performer: Emma Richardson. Performer: Emma Lloyd. Performer: Alice Purton. Performer: Linda Jankowska. Performer: Rocio Bolanos. Performer: Emma Richardson. Performer: Mauricio Pauly. Performer: Daniel Brew. Performer: Sabrina Schroeder. Performer: Emma Richardson. Performer: Alice Purton. Performer: Rocio Bolanos. Performer: Linda Jankowska. Performer: Emma Richardson. Performer: Alice Purton. Performer: Rocio Bolanos.